Wise 8WD140 Series Plastic Bucket Style Seats Are Built with Strong Plastic Injection Molded 1 pc. Frame. Ergonomically Designed For Greater Comfort. Mounts to any BIA Standard 4 Bolt Pedestal System. 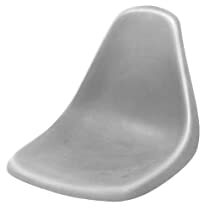 Seat Dimensions - Height: 16", Width: 17", Depth: 19"
So I bought this seat for my drift trike. And long story short, I hit a truck bumper going about 35 miles per hour and this seats high back and strong construction saved my spine and ribs. If ten was possible. This would be a ten star. It is a nice and strong seat. It fulfilled my expectations. The bad aspect of this purchase is that they announced monting hardware included, which actually did not come. I installed these seats on my deckboat and if you weigh under 200 lbs they will be fine. Not as heavy duty as I would have expected.